Tom Francis, maker of Gunpoint and now of indie sci-fi game Heat Signature, has released ten minutes of new gameplay in which its factions, which will be your main employers, are revealed and discussed. He also announced that he’ll be working out of Valve’s offices in Bellevue, Washington state, for a short time – and he’d like the help of a programmer to help him squash bugs ahead of the game’s launch. If that’s you, this is, technically, a chance to work alongside Valve. For more products of imagination, passion and late nights, check out our list of the best indie games on PC. In the trailer, you can watch Francis spawn a few faction ships – each different, thanks to procedural generation – which he then docks with and explores, discussing their differences in design. The Glitchers are the military of an advanced civilisation, but were accidentally teleported away from their home world, and now have to scavenge for ship parts (though they do have teleportation technology). Sovereign are a ruthless, wealthy mega-corporation, who hire only the best and believe in the quick and tidy solution of removing their enemies by killing them (hence they’ll offer you many assassination missions). Francis then showed the mission computer, where you’ll look through the jobs offered by these factions and decide which to accept. It’s a helpful trailer to get a sense for what you’ll actually be doing in Heat Signature, which is exploring a procedurally generated galaxy, breaking into larger ships, and sneaking around them for various nefarious purposes, perhaps at the behest of such an employer as these factions. You can take down guards in combat, hide bodies, steal weapons, hijack a ship’s gun turrets or even steal the whole vessel for yourself. So that’s the new video. The Valve announcement comes via Francis’s blog– he’s cagey with the details, but “they want my input on something, and I’d obviously welcome theirs on Heat Sig, so I’ve accepted their offer to come and work on it at their offices instead of my bedroom.” He’ll still be independent, and will be there for three months at most. If you’re a technically adept programmer in the Bellevue, WA area who would like to help him finish a fun-looking indie game (and work alongside Valve), he’d like to hear from you. Check out his blog and consider an application. 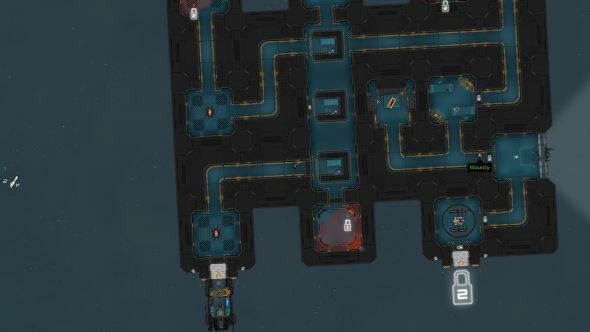 For more information on Heat Signature, check out its Steam page.